The guide to cooking with fire and feeding a crowd, restaurateur Ben Ford gives step-by-step instructions with photos and illustrations so that you can grill, smoke, or roast the whole beast outdoors—or prepare a “tamed” version of the feast in your home kitchen. Cook big. Play with fire. Get your hands dirty. Chef Ben Ford is known for wowing crowds with his handcrafted feasts of enormous proportions—a whole pig roast, paella for eighty, burgers for the block. 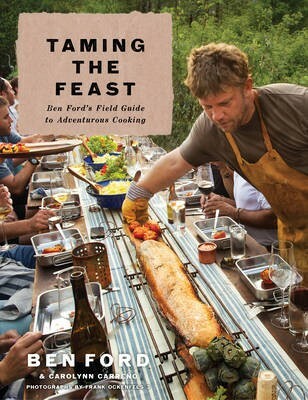 Now, in Taming the Feast, his complete guide to outdoor grilling, smoking, and roasting, Ford divulges his secrets for nine jaw-dropping feasts for the adventurous home cook and DIY enthusiast. From mouthwatering Texas-style barbecue to Wood-Fired Paella, these entertaining blueprints can be used to throw a party for the whole neighborhood or an intimate dinner for four. A culinary MacGyver, Ford also provides unique complete do-it-yourself primers for making simple custom outdoor cookers that coax the ultimate flavor out of salmon, pig, rabbit, burgers, bratwurst, turkey, and lamb. Here are easy-to-follow step-by-step instructions, drawings, and timelines for constructing a baking barrel, cinder-block oven, smoking shed, and roasting box in your own backyard. Ford’s food reflects his passion for artisanal techniques, innovative combinations of flavors, and seasonal ingredients. Delicious sides, including Avocado Crostini with Tomatoes, Capers, Olives, Almonds, and Arugula, Persimmon Salad with Goat Cheese and Candied Pecans, Cheddar Cheese Loaf with Artisanal Ham and Spicy Brown Mustard, complement hearty main dishes. Each feast ends on a playful note with delicious desserts like classic S’mores with homemade marshmallows and graham crackers and Coconut and Banana Cream "Pies." Each chapter also includes creative recipes to make use of the leftovers you’re sure to have. Taming the Feast is further enlivened by gorgeous photography and Ford’s stories of growing up with his father Harrison Ford, then a carpenter, and his life as chef at some of California’s most celebrated restaurants working under such pillars of California cuisine as Alice Waters, Paul Bertolli, David Tanis, Nancy Silverton, Mark Peel, and Eberhard Müller. Whether you are hosting a pig roast, a fish fry, or a backyard barbecue family reunion, you can be sure everyone will leave your party entertained, well fed, and raving about the food.